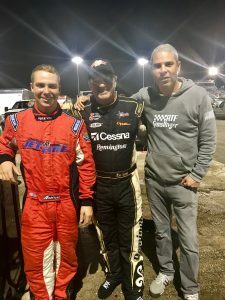 DAYTONA BEACH, Fla. (January 21, 2018) – Cole Anderson, the 20-year-old self-described “racing late bloomer” from Minnesota, is set to kick off his 2018 race season with ATF & Gunslinger at the World Series of Asphalt Stock Car Racing during Speedweeks at Florida’s New Smyrna Speedway next month. With the Daytona Beach, Fla.-based team under the guidance of NASCAR Camping World Truck Series champion Mike Skinner and team owner Andrew Franzone, ATF & Gunslinger enlisted the up-and-coming driver to compete in Pro Late Models and Super Late Models throughout the 2018 season. After catching the attention of Skinner, Anderson will race with the experience of ATF & Gunslinger’s veteran crew behind him. With the team doing everything from competing at the late model level to building and preparing NASCAR Camping World Truck Series trucks specialized for competition at motorsports festivals and recording speed records at race tracks across the country, the team is well versed in a variety of motorsports disciplines. In addition to competing with ATF & Gunslinger for a varied schedule of Pro Late Model and Super Late Model events across the Southeast, Anderson will join the team for key events, as the team looks to develop not only the driver’s talent on the track, but also help him develop off the track, too. The team’s first outing of 2018 will be a trip to Charlotte Motor Speedway’s new road course track, nicknamed “The Roval,” on Monday, January 22. Skinner, a NASCAR Camping World Truck Series Champion, will make hot laps around the track, shaking down his truck to prepare for the team’s June trip to England for the Goodwood Festival of Speed, before giving rides in a second two-seater truck to members of the media. Meanwhile, Anderson will have a chance to engage with the various participants and guests at the track. For more information about Cole Anderson, visit ColeAndersonRacing.com.